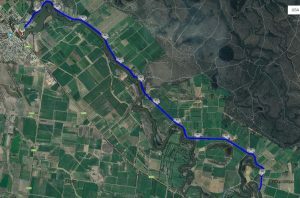 The Leeson Solar Pty Ltd 50km Cycle event begins at the town bridge and winds its way along the scenic Island Road before hitting the turnaround point at Burkes Bridge. From here you will cycle back into town along the same road where you will complete your first loop. Turn around at the entry to the Cohuna Recreation Reserve and complete a second loop. Your finish line will be at the town bridge. Both the 25km and 50km cycle events begin at the same time. The start line is on the island side of the town bridge in Cohuna, near the entrance to Cohuna Recreation Reserve. The course follows Island Road 12.5km out to Burkes Bridge where the turnaround point is located. 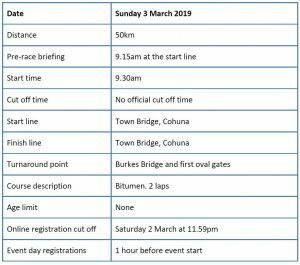 From Burkes Bridge, riders will return into town where they will reach their second turnaround point at the entrance to the Cohuna Recreation Reserve. Repeat the course out to Burkes Bridge and head back into town where you will cross the finish line at the town bridge. Island Road is fully bitumen and is suitable for all weather conditions. It is a windy road and riders will need to be aware of other riders using the road in both directions. Thanks to Leeson Solar Pty Ltd for their generous sponsorship of this event.